Rent a 2019 Peach Tree! Now you can share in the yield of fabulous tree-ripened peaches that taste and smell as fresh as peaches should! These juicy beauties are hand-picked at the peak of perfection and shipped to arrive within 2 days after being plucked from the tree. Peaches in supermarkets have been picked 6 weeks before they ripen -when they are still hard as a rock! 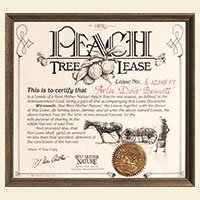 Rent a peach tree for someone who would enjoy peaches from their own tree. The Lease Document is calligraphed with your recipient’s name, and comes with an Announcement Card explaining the program. Periodic Progress Reports provide facts, anecdotes and folklore about the grove. We can even send a photograph of the tree “hard at work” at blossom time. Sorry, Georgia Peaches can’t be shipped to California, Arizona, Hawaii or Alaska. Give a friend a share of the harvest from a small Georgia peach farm by leasing one of their peach trees. Their fabulous tree-ripened, fresh peaches taste, feel & smell as peaches should! These juicy beauties are hand-picked at the peak of perfection and shipped to arrive a few days after being plucked from the tree. Last Christmas I sent all my gifts from Rent Mother Nature and my friends and family were all delighted with their leases and farm products. Luckily for me, someone was kind enough to send ME a peach tree branch. The peaches were luscious. I refuse to eat peaches from stores, even though they are my favorite fruit. Why be disappointed? But Rent Mother Nature’s peaches did not disappoint at all! And one person I’d sent a lease to told me they filled the room with a delicious fragrance and tasted great. I am now sold on Rent Mother Nature as an easy and small-farm-supportive way to find gifts people will definitely use and love. We enjoyed the picture and updates that were mailed to us. When the fruit arrived, we found it great! Peaches are just divine (smell and taste like peaches should). Loving every mouthful. I love you guys…we’ve already given out a couple of “lease gifts” ourselves. SOOOOOO much better than naming a star after someone, yes?! !